The facetious joke – or is it a wry compliment? – about white monochrome paintings is that they hardly differentiate themselves from the walls they hang on. Despite choosing as his pictorial subject rectangles of blank white wall, Nathan Hylden worked hard to make the paintings in his exhibition ‘So There’s That’ as unblank and as unneutral as possible. They are richly inflected by light and subtle colour, by movement and painterly incident. They are even covertly personalized: some of his paintings refer, in their compositions, to the artist’s exact height. Their mutually interfering layers – photographic screen-prints over gestural brush marks, underneath graded fogs of spraypaint – mean that there is always a lot to look at. The traditional anti-aesthetic of unadorned blankness is dashingly aestheticized. A suite of seven untitled paintings (all works 2011) deploys many techniques already tested in the artist’s earlier work. Despite being listed (and sold) separately, these works were made simultaneously, their sequential variation integral to their meaning. It is sad to imagine the group being split up. Seven photographs of Hylden’s studio wall show the shadow of a stepladder moving, from image to image, across the frame (presumably the result of the setting sun, although the effect could easily have been faked). In the photographs, leftover masking tape corners show where one of the artist’s previous pictures – cut to his exact height, as his paintings often are – was once fixed to the wall. Hylden transferred the photographs, at one-to-one scale, onto thin sheets of mirror-polished aluminium as half-tone screenprints, sandwiching them between a ground of wetly brushed zigzags and a topcoat of sprayed white acrylic so that it became almost impossible to separate, for instance, accidents of printing from imperfections in the original wall, or brush marks from photographed smears of wall-filler. Formalistic process and deft illusion are flattened to the point at which the paintings very nearly surrender to the blankness of the wall again. Despite their conceptual and processual tightness, Hylden’s paintings are luxuriantly easy on the eye. They are neat, secure in their conceits and confident of their affects. They provoke none of the discomfort one might feel in front of, for instance, a noisy Christopher Wool painting (an obvious influence on Hylden). They are awash with sunlight and calm. A pair of ambitious new paintings, however, in Richard Telles’s main gallery, admitted the artist into less-charted territory. These works, also untitled, are outwardly simpler than the series of seven paintings in the smaller rear space. Again, they show a patch of the artist’s studio wall, photographed and converted into a half-tone pattern, overlaid onto a brushy wet field of pearlescent gold. What is astonishing about them, however, is their scale: each canvas measures almost three-and-a-half by six metres. Hanging side by side, they occupied most of the gallery’s longest wall. The section of studio wall that they represent, however, lit from the side so as to accentuate its texture, must only be a few centimetres wide, and the half-tone image is blown up so that each dot is the size of a thumbnail. 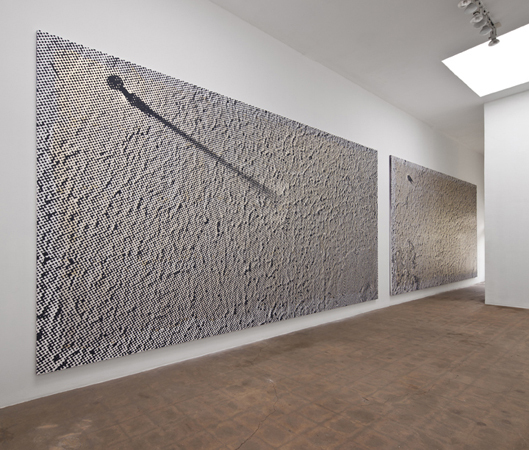 To help us gauge the scale of the magnification, Hylden has included in one photograph a screw, half sticking out of the wall and casting a long shadow diagonally across the canvas. In the second picture, it has been removed. It is, in a sense, a great big picture of nothing. Increasing the size of a painting can be a cheap way of making it more impressive, but Hylden does not approach scale lightly. In the past he has favoured the matter-of-fact equivalence of picturing objects at life-size. Here the effect is to immerse the viewer in the crazy logic – and intermittent collapse – of an intricate system of representation. While the paintings are impossible to view at a distance (it is a narrow gallery) they are also dizzyingly hard to look at up close. The phenomenon suggests that the critical moment in all of Hylden’s work – the other paintings in this exhibition included – is when he causes the viewer to zone out, to get lost on the threshold of conflicting representational registers. Hylden shows that sometimes even pictures of nothing can be too much.